How to install MariaDB in Ubuntu 16.04 LTS? MariaDB is an open source database. It is one of the most popular databases in the world. Many Tech giants Google, Oracle uses it for the their database solutions. MariaDB is known for its performance and scalability and managed by MariaDB Foundation. In this tutorial, we will install MariaDB in Ubuntu operating system. This whole precess includes the following steps. Make sure, system meets all the following prerequisites. 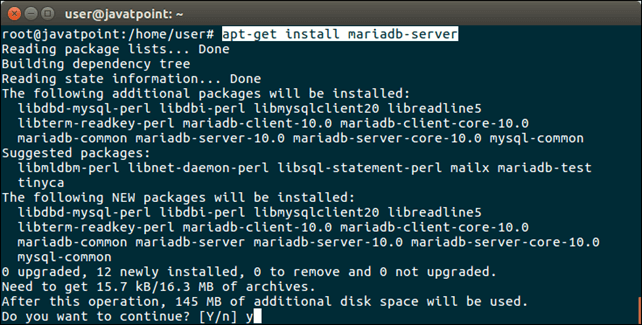 Use the following command to install mariadb. After installing, login into MariaDB. After login, we can set new user and credentials. Now, login again with new user javatpoint. Well! It is working fine and we have successfully installed MariaDB on Ubuntu.